"Breaking new ground in Eating Out West, with its offering of gluten-free fish & chips on the third Sat of every month. Clean, quick, offering decent-sized portions, and reminiscent of the chip shops of your childhood (charming Formica and steel counter, tiled floor and walls). Pies and pasties alongside the cod, plaice and haddock. Open Mon-Fri 11.45am-1.45pm & 5-10.30pm, Sat 5.30-10pm"
Dr Gill Hart from www.YorkTest.com had kindly offered to answer questions put forward by the readers of this blog. York Test provide tests for food allergy and intolerance. With just a small sample of blood, they can determine what foods can cause you problems. Please comment on this blog with your question or send me a direct email to me and I will forward the question onto her. Your question can be anything relating to food allergy or intolerance and testing. I will then post all of the questions and answers on this blog. Birdseye Potato Waffles are now Gluten Free! No link I'm afraid as the Birdseye website still says they contain wheat - bad marketing!But as you can see the actual packaging clearly says Gluten Free - and they were 99p! Last night I had my special 'whatever is in the kitchen chilli' on waffles. If you like slow-cooked spicy beans, you'll love this recipe! RECIPE Gluten Free Tortilla Night - Finally! See previous post for details on the tortillas themselves.We picked them up from the Otomí shop in Clifton, Bristol on Sunday. I am totally in love with the Mexican look so I've been dying to go to the shop ever since we moved to Bristol. And as expected, I wanted to buy just about everything. Will have to return after pay day! 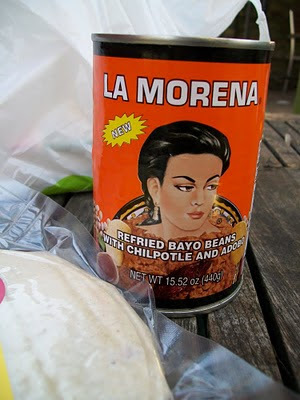 We managed to leave the shop with just a can of re-fried beans and a packet of corn tortillas. Now to create the filling! Mrs Crimbles Bakewell Slices are the scrummiest gluten free and dairy free cake slices there are. Me and my husband inhaled a packet last night. Now I fear I might have to eat a packet a day. 15cm Fresh Corn Tortillas (pack of 13)Cool Chile soft corn tortillas made from white maize. Suitable for freezing and gluten free. Get them from http://www.otomi.co.uk/cornproducts.html or the shop itself in Clifton arcade, Bristol. £2 for 13 of £5.50 for 1kg. I'm picking mine up this weekend! Very excited! Soup in a cup! Not the most saliva inducing phrase is it? My experience with cup a soup et al goes back to when I was a student. Powdery, even when you've followed the instructions to the letter and stirred for hours, weirdness floating on the top and made from basically flour and colourings. I was in Sainsbury's looking for lunch ideas for the trade show I go to every year at the NEC, Birmingham. I figured that if no microwave was available I could utilise a coffee machine in the canteen, use the free hot water and make myself a bit of soup. As it turns out, the canteen had started selling gluten free sandwiches so the soups went unsupped. I found the soups in the cupboard on the weekend and decided to give one a go. 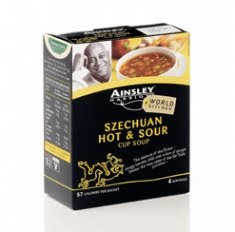 The soup pictured is the one I chose and comes from Ainsley Harriot's 'World Kitchen' range of 'cup soups'. This one is gluten and dairy free. This recipe is adapted from The Everyday Wheat-Free & Gluten-Free Cookbook.I picked this book up in a charity shop and it quickly became obvious why it was discarded! The book was published originally in 1998. Imagine what recipe books for vegetarians were like in the 70's....that'll give you some idea of the recipes in this book! E.g. Turkey with Artichoke Hearts & Orange Sauce, Bacon, Apple & Sausagemeat Flan, Cranberry & Tofu Risotto. Maybe that sort of thing is, er, your thing. If so, this book is for you. I was expecting the desserts to be like the mad dishes that Letitia from the Vicar of Dibley served up but they seem to be OK aside from the weird instructions. Have been trying to get these for ages. I once ordered a big home delivery from Asda with these on and they emailed me at the last minute to say that they couldn't fulfil the order. Anyway I finally found my namesake sausages. The cooking instructions on the back said shallow fry or grill but I decided to just bake them in the oven as I was still working and I couldn't keep an eye on them. I hosted my first ever pancake party last night and it was a big hit!6 of us sat around a table and could pick from sweet and savoury pancake fillings including bacon, cheeses, fruit, lemon and maple syrup. Only one person went for the traditional lemon and sugar and that was my hubby! It was great hearing people say "Have you tried this with that yet?!" and it made an hour slaving over a hot non-stick pan all worth it. In all, I made 3 batches of pancakes. 1 - Using the Mrs Crimbles Mix, I just added 2 eggs and soya milk. The photos above are of these pancakes. 2 - Using a recipe for 'Brittany Pancakes' from a gluten free cook book and I used Dove's gluten free flour, one egg and soya milk. 3 - Using a recipe for 'American Buckwheat Pancakes' from the same cookbook and I used Dove's Gluten Free flour and cow's milk. The first stage of my Po'boy - bread sliced in half and baked, lots of mayo, sliced gerkins and tabasco sauce. The second stage of my Po'boy - I've added slow cooked pork and beef gravy! The Po'boy below was my husband's creation. What's in it? Everything. And I mean everything. My dinner last night was out of this world amazing! I was suddenly inspired to re-create a Po' boy at home as we had leftover slow cooked pork in the fridge. Then, my husband pointed out that we also had leftover beef gravy from the Braised Beef we made on Friday night - so the deal was done. All we needed to buy was the bread. I have a box of Mrs Crimbles Pancake Mix sat in my cupboard ready for Shrove Tuesday tomorrow. I'm hosting a dinner party and I'm going to make a heap of pancakes and provide an array of fillings. Past favourites of mine are: smoky cheese and bacon, Boursin, chorizo, banana and squirty cream, Bailey's chocolate ice-cream sauce and you can never go wrong with lashings of maple syrup :)Easy and fun!I will post the results here ASAP. In the meantime, here's a link to my last post on making gluten free pancakes using gluten free flour etc. P.S since going dairy free too, I've discovered that you can substitute milk for soya milk in exactly the same quantity and the result is the same, if not better! I found this lovely recipe on the BBC Good Food website. I had a couple of parsnips going spare from my roast on Sunday and my fridge seemed to contain exactly the ingredients required (and not much else). I love it when that happens. I followed the recipe exactly but my parsnips were underdone. I don't think I chopped them small enough so ensure that they are diced otherwise you'll need to roast your veg for a bit longer. I would slightly change this recipe. I reckon the tomatoes are an odd addition and I would maybe try a sweet potato next time and add a bit more liquid. Otherwise, this is a fab recipe and a lovely winter warmer and was great the next day microwaved for my lunch.